Uriah Heep, one of the hardest working bands in the world, are a also band of touring musicians. Their travels have spun them around the world many a time over. But never to Armenia, a landlocked mountainous country in the Caucasus region of Eurasia and former state of the Soviet Union. Uriah Heep gathered there for a concert on the Wake the Sleeper tour for both old and classic tunes, with the sound and video machines recording the history. The set seems to be weighted to modern Uriah Heep, but that matters little as 2008's Wake the Sleeper revived this classic band and this year's Into the Wild only reinforced their vigor. Of the newer material, mostly from Wake the Sleeper, Tears of the World, What Kind of God, and Angels Walk With You are the show-stoppers. Shadow not so much. For the classics, Heep picks some good ones including July Morning, Stealin, Gypsy, and the ever impressive Easy Livin. I'm sure older fans would have asked for more of the familiar, perhaps Sweet Lorriane, Circle of Hands, or The Magician's Birthday, than the modern. But the set is good, especially when the organ erupts for opening encore number Sunrise. 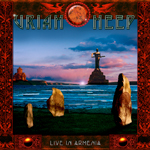 Live in Armenia is a fine and entertaining glimpse of the modern and classic Uriah Heep. Fans, old and new, should be pleased.